The “exclamation point” – ! – as an epithet adds umph to a given phrase. Writers from decades ago would use them sparingly to really prove a point and the mark itself would carry weight. Its raw power has since diminished somewhat: communication via text requires serious self-editing to ensure that tone and intent carry forward with meaning. Good, modern writing still holds an exclamation point’s residual restraint, too. The decision to not use an exclamation point carries meaning and tone with it, if the writer uses the mark sparingly. Too often a writer will riddle her work with points to scale back an unpleasant tone, or to push an enthusiasm, when there is obviously none. Haphazard exclamation points exude phoniness an a false take on whatever “honesty” means. Overuse destroys meaning in favor of creative safety, which is not always bad. 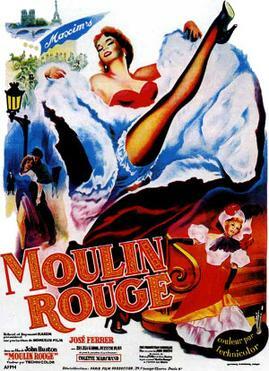 Audiences love the clean pastiche of Moulin Rouge! The plot is simple and unoriginal and two hours outlines a full character palate and arcs. 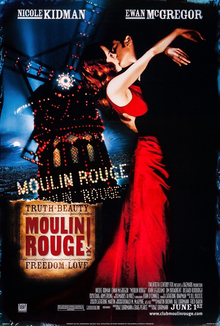 Director Baz Luhrmann executes the idea in a coup de grâce to John Huston’s 1952 take on Sidney Lanfield’s 1938 remix of Ewald André Dupont’s silent Moulin Rouge. Film has captured four iterations of Bohemia through six decades of human review, processing a rewrite each time as the Moulin Rouge itself fades further into distant memory. Cabaret is not a popular destination anymore that modern young people seek out, so Luhrmann took as many appropriations from modern culture and plopped them into the shell of a Moulin Rouge and topped it with a deft “!” as if shouting it from the balcony of the place itself a century later. Neither Huston’s 1952 film nor Luhrmann’s 2001 “experience” presented a plot or characters to capture a meaningful takeaway [only these two iterations earned a nod]. The former, a wildly incoherent Henri de Toulouse-Lautrec bi0pic, may as well have told a story of a no-name actor or vagrant for all the misfocus on either Toulouse-Lautrec’s celebrity, his disability, his substance abuse, his “tear between wealth and truth.” Much of this film could have been told documentary style if it meant to instruct and instead leads Jose Ferrer and Zsa Zsa Gabor around in some sort of relationship debacle as he struggles with class and alcoholism. The latter panders to an audience primed for 2005’s Crash: nonsense clippings of popular culture shoved into a musical-theatre-within-a-musical plot intended to let its audience in on the joke immediately. Set and costume direction proved excellent and stole the show away from the “cuteness” of medley, surprisingly not done a capella. Moulin Rouge! entertains, certainly, but not in a critical manner that best defines a year, let alone five generations. This single “!” is too kitschy for an Oscar-worthy Best Picture win. Future Moulin Rough adaptations beware: a “?” would fit purpose and tone accordingly. The year 2001 nominated some heavy-hitting films, like (winner) A Beautiful Mind, Gosford Park, the first Lord of The Rings (Fellowship), and slow-burn In The Bedroom. The only way Moulin Rouge wins in 2001 is if it is the only film nominated, and even still the Academy might find it needed to have added an exclamation point just to not seem bored by their own choice. The Greatest Show On Earth (starring James Stewart and Charlton Heston) – 1952’s winner – showcased fame and anxiety through a physical manifestation of an exclamation point (a circus) and competed against Gary Cooper (High Noon) and John Wayne (The Quiet Man) and a Crusade-era biopic that sounds like a Native American one – since mostly forgotten – Ivanhoe. Both of the winners won because they emphasized their weight with a resounding period.